seriously, SWOON! I have a new favorite piece of furniture! this project has been a long-time in the making so the fact that it is finally done is sort of a miracle. I have been interested in reupholstery for a while & completed smaller projects (upholstered lack tables HERE & our old headboard) but have been waiting to do a much bigger project. 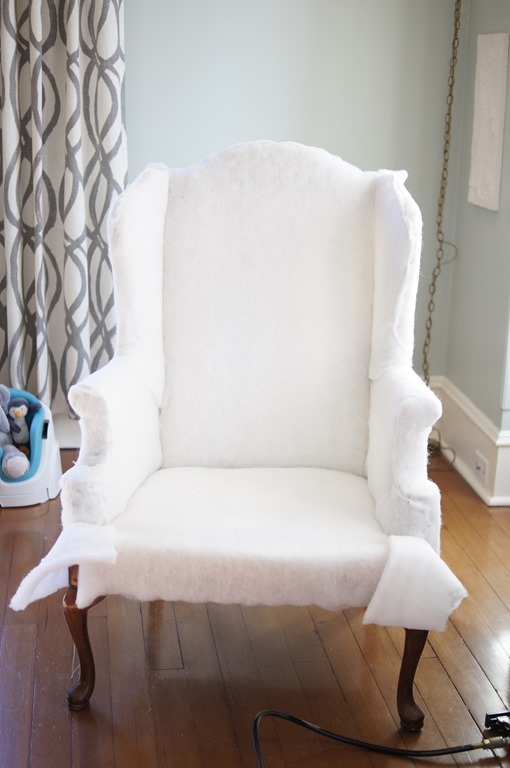 I found this wingback chair on Craigslist almost three years ago (right after we bought our house). it was listed for $5 so we went to take a look & it was in such good shape. 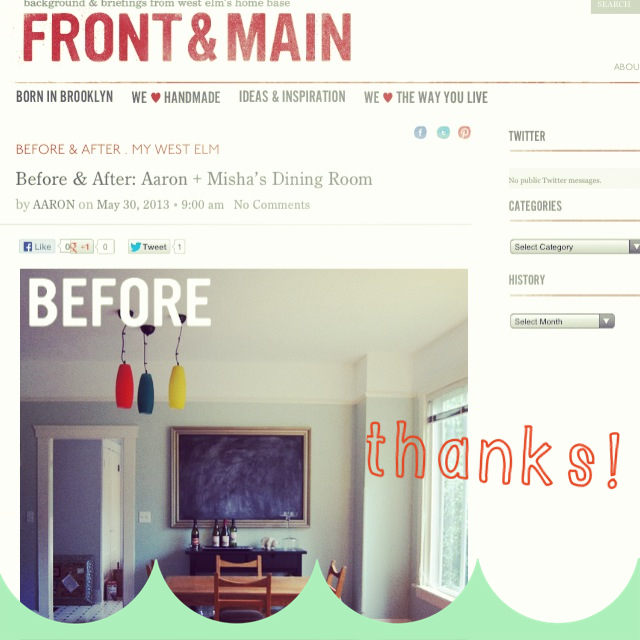 we gave the sellers $10 for the chair & delivery – such a good deal! then the chair sat in our basement. & it sat & sat. I finally decided on a fabric & bought it, & then had buyer’s remorse & bought another fabric. it moved with the other things into storage last spring to make way for the house renovation & then came back & sat in our living room. finally in january while aaron was on paternity leave I decided it was do or die. I had to at least start to reupholster it or I knew I never would. & three months worth of naptimes later it is finally complete! 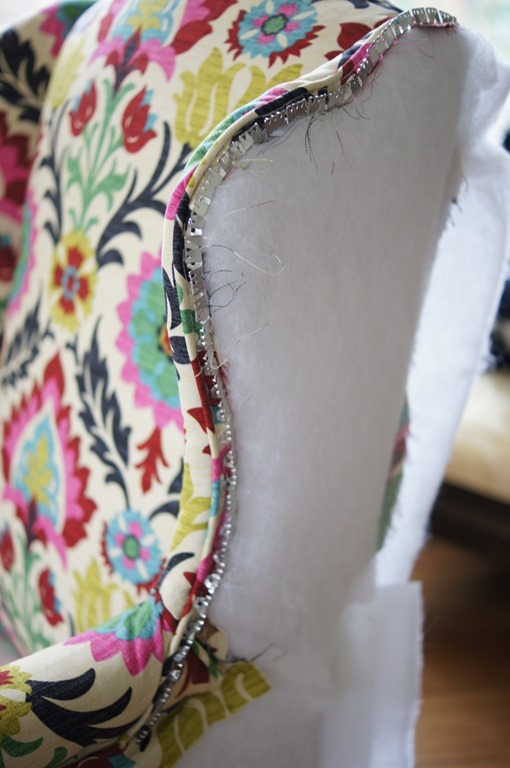 reupholstering is a pretty meticulous process, though you can almost always go back & do something over again if it doesn’t work out right the first time (you just have to be willing to pull out all of the staples again!). I was surprised how quickly the chair came back together since taking it apart took forever. camera – for taking lots of pictures as you take the chair apart! 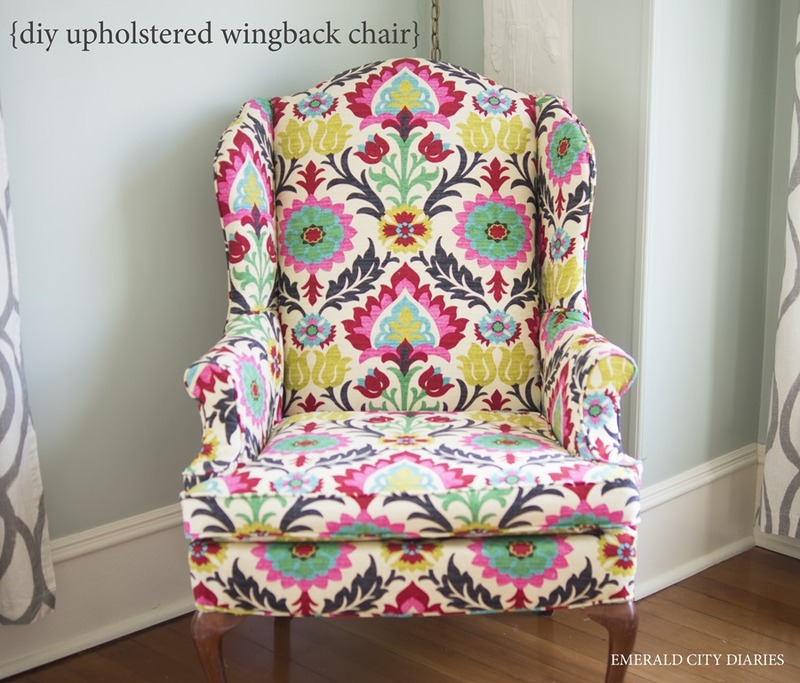 after finding your chair & choosing your fabric, the first part of reupholstering is to un-upholster your chair. this is really time intensive as there are likely 7 million staples, plus you want to document as much as you can since you will want to put the new fabric & pieces on the exact way they came off. I took pictures as I removed pieces (hundreds of pictures which I will spare you!) but in hindsight & for a few particular places I wish I would have set up a tri-pod & videotaped those sections. just something to think about. also, as I removed pieces of fabric, I annotated on the front with a Sharpie about how it went on – like whether there was a tack strip on one side, or piping, or whatever. 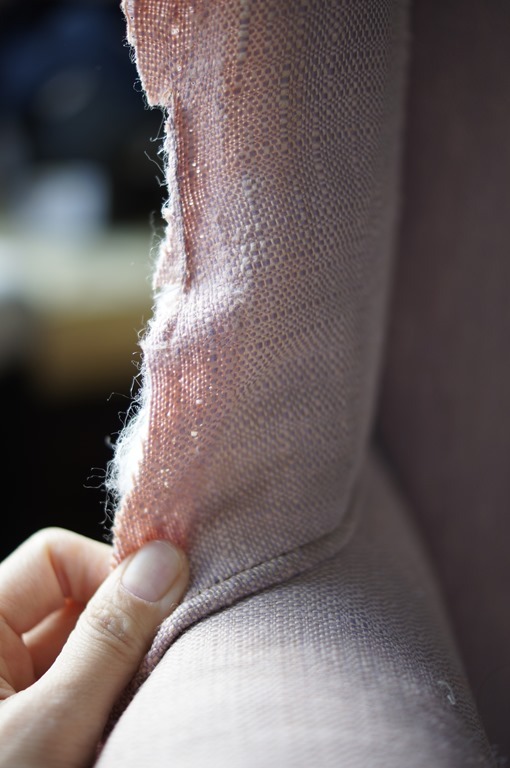 once your chair is completely stripped, you will want to check the structure for any damage. 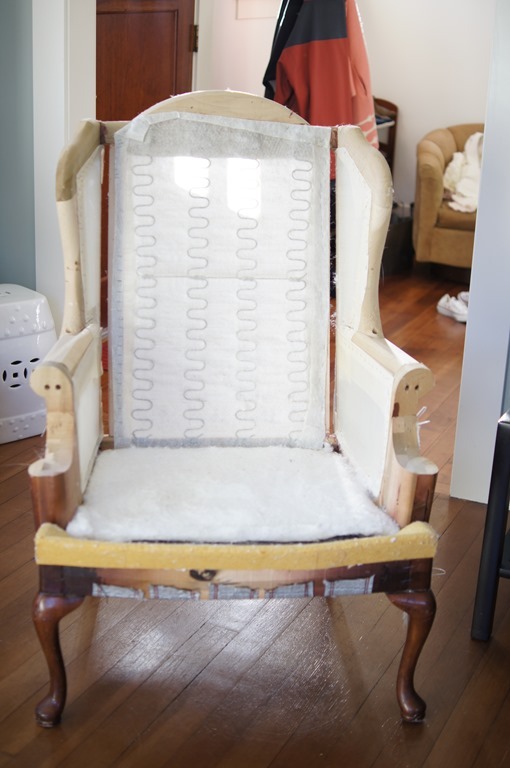 unfortunately, you may get to this point & figure out your chair isn’t worth reupholstering… that would be a bummer. hopefully you find that the structure is in good shape as well as the bottom springs, etc. next you’ll want to cover your chair in at least one layer of batting (I did two on the wings & sides). you can also do a layer of foam underneath the batting. I didn’t because there wasn’t any originally, except for on the back upper cushion which I reused since it was in great shape. the nice thing about reupholstering, starting with batting, is that you don’t have to cut pieces exactly right. as long as there is enough material to cover the section, you can cut away any extra as you are stapling. & if you didn’t cut enough material to begin with, you can always add without there being weird seams since it will all be covered with fabric anyways. 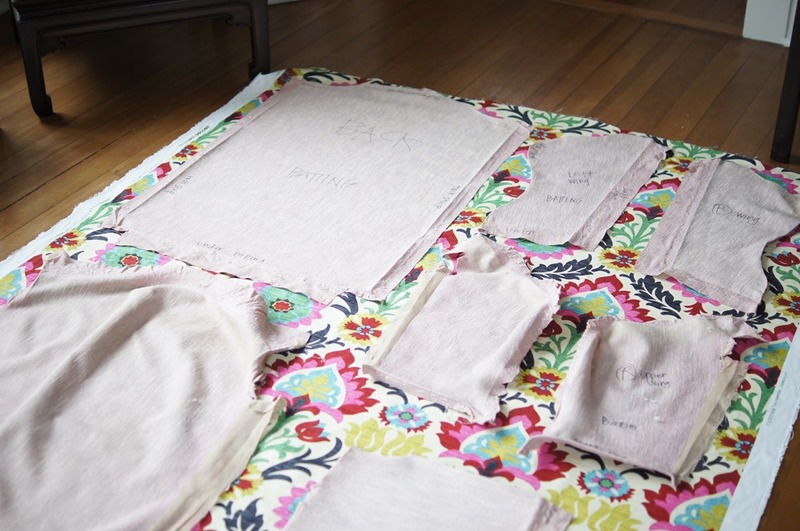 then you will want to lay out all of your pieces onto your new fabric & use them as patterns. 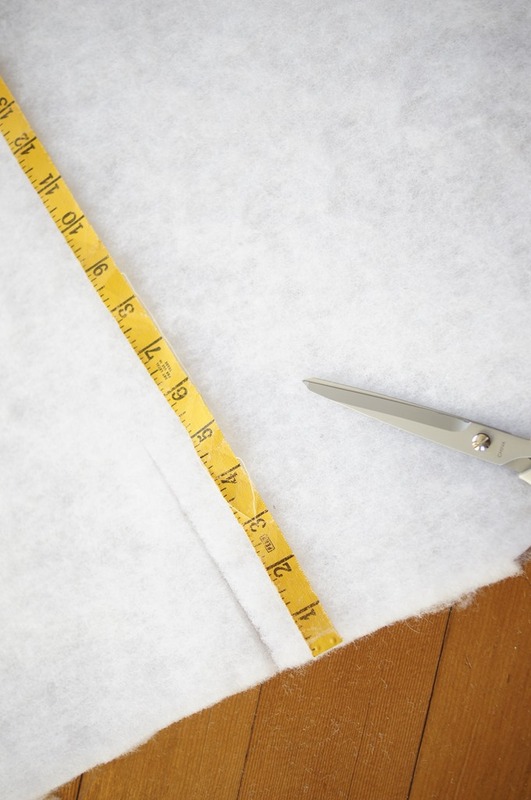 if anything, you will want to cut things big because you can always trim them down. 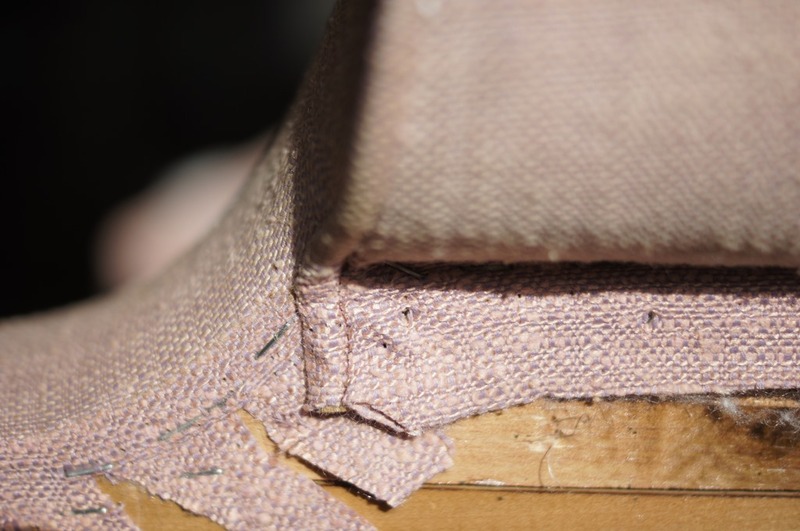 also make a note of extra cuts or jagged edges on the original pieces – these places are where the fabric had to be cut in order to fit into or around part of the chair structure & you’ll want to duplicate them as best you can. also, if you have a pattern like the one I used where you want specific parts of the fabric to be on specific parts of the chair, you’ll want to cut all of your big pieces first (lay them all out to make sure you have enough fabric) & then use the extra fabric for smaller pieces where the pattern doesn’t matter as much. for me, the front & back pieces, the front & back of the cushion cover, & the very front bottom edge of the chair where important for me to have the same floral piece centered; so I cut all of those pieces first. I sewed all of my piping before I really started putting the chair back together. I needed different pieces of piping along the way & I figured it would be nice to have it all done from the beginning & not have to stop & sew some together if I needed it for a certain section. I used the tutorial linked above. 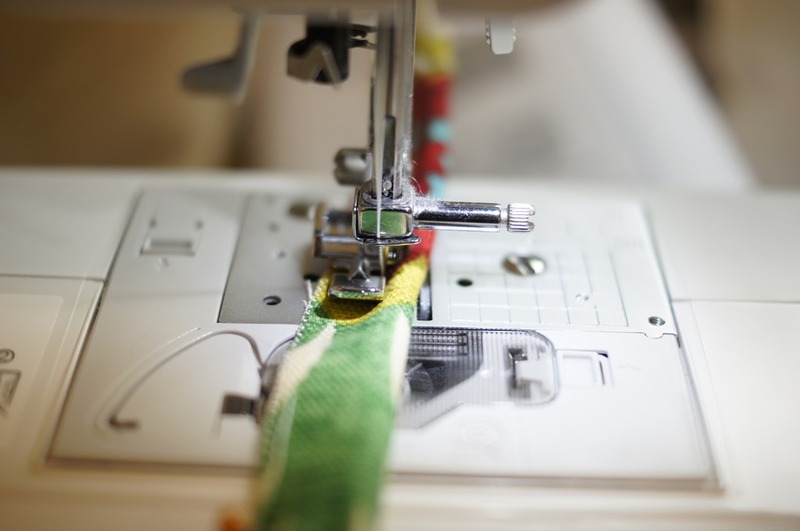 as long as you have a zipper foot for your machine, you are pretty much good to go. I decided against making bias strips since there weren’t a lot of curves in my chair pieces where piping would have gone. for the chair cushion I was going to do bias strips, but the original cushion didn’t have separate pieces of piping (it was part of the front & back seat fabric) so I just followed the original design. I also sewed the cushion cover at the same time I did the piping since I was into the sewing groove & needed to do piping for the cover anyways. 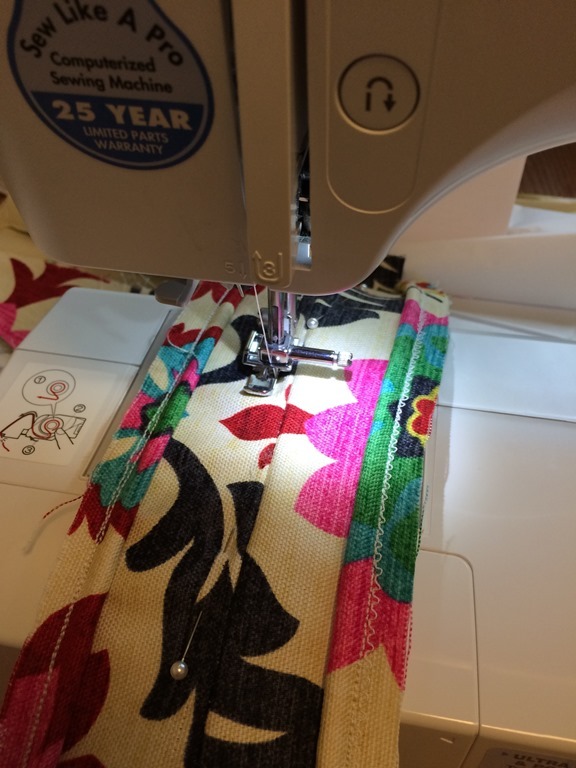 I was able to re-use the zipper & the cushion which was helpful. down the line I may replace the cushion, but for now it works. 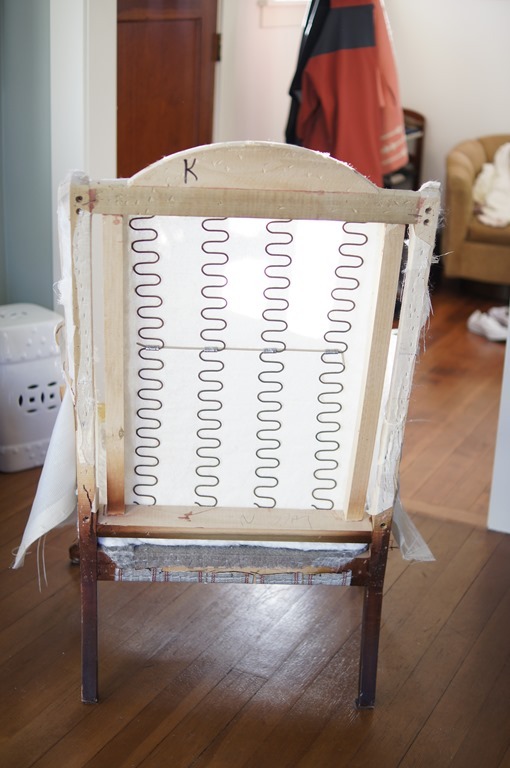 when it came to attaching the fabric to the frame of the chair, I started with the front part of the chair. it was one of the largest pieces, but also one of the easiest to put on. 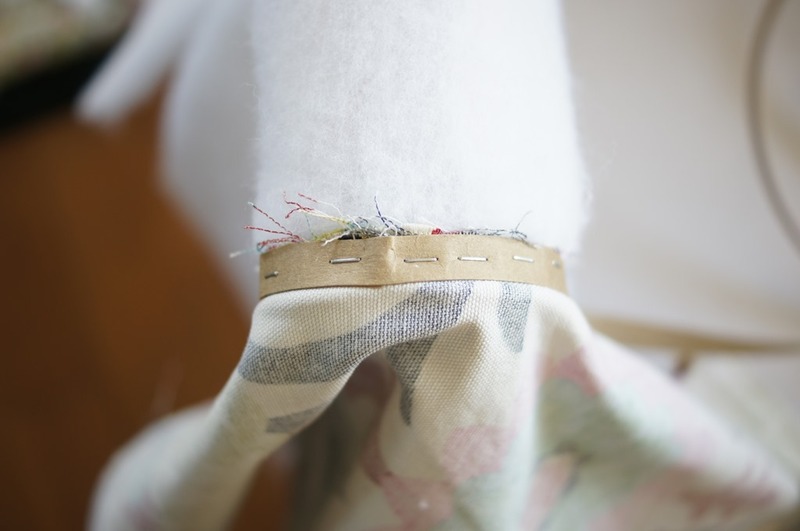 from there I moved down to the bottom front edge of the chair where there was a piece that had to be sewn together (one piece was printed & wraps around the front edge, & the other piece was plain cotton muslin & ran under the cushion). I then moved to the arms of the chair. the two pieces that covered the arms had sewn pieces (the front oval shapes on the arm rests) in order to more easily attach the piping around that section I assume. 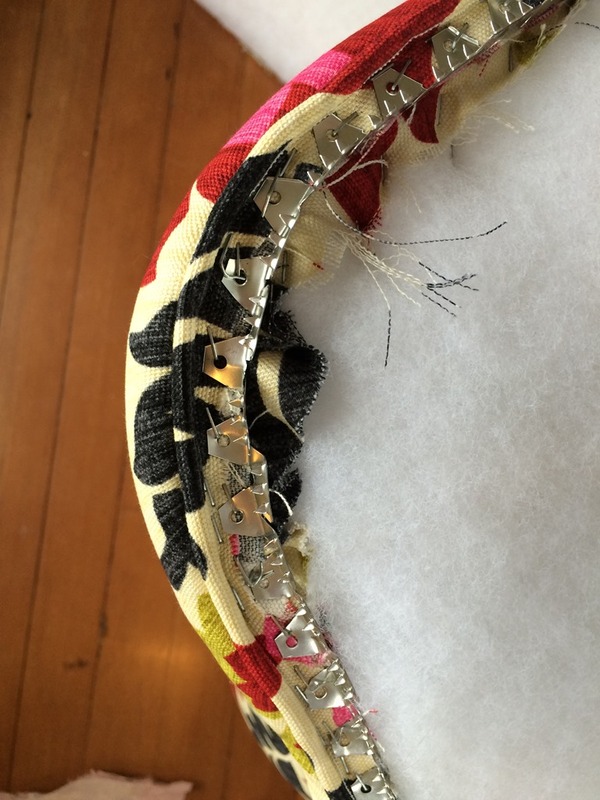 because it was sewn together originally, I did the same thing when it came to reattaching. up next were the inside wings, & then the outside wings. after I did the bottom sides of the chair. the last big fabric piece was the back. lastly I did the piping that ran along the entire bottom edge, & finally the bottom dust cover (which I was able to reuse the original). 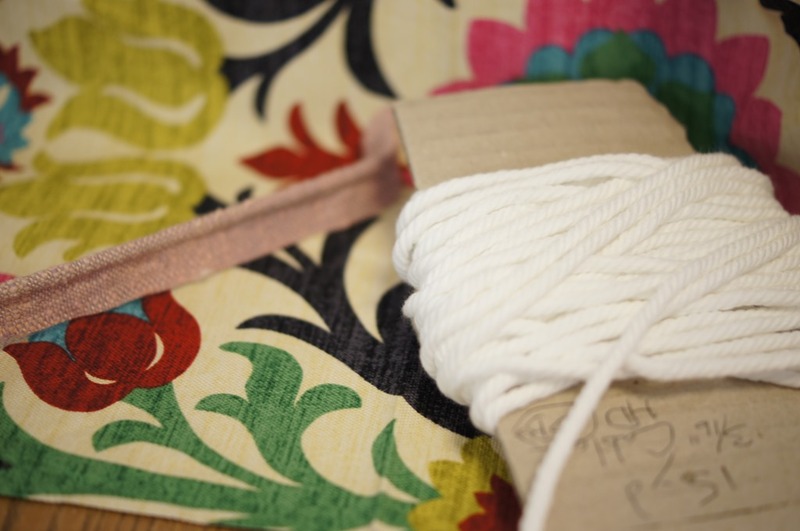 there are a few places that I used extra upholstery pieces to help get clean lines or edges using materials listed above. 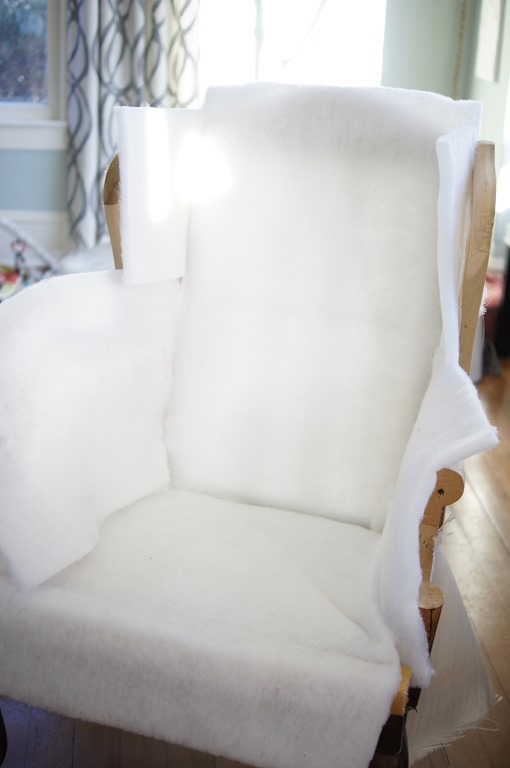 I used the cardboard tack strip (essentially a skinny piece of flexible cardstock) along the top curve of the arm rest, along the top of the piping on the inside of the chair wings, & in the top few inches of the chair back. I used the Ply-Grip (after watching the video) along the outsides of the wings, directly underneath the bottoms of the arm rests, & along the back curve of the top of the chair. & I used the tack nail strip along the top & sides of the bottom outside pieces, & along the outsides of the big back piece. a lot of reupholstering is just mimicking how the pieces were originally attached, so photos or video of the original chair & it’s disassembly are the most valuable in a project like this. you just have to go for it! I had to break my work over three months worth of naptimes & a few chunks of time on the weekend because of the nail gun. I could run the air compressor during eloise’s naptime & luckily the compressor doesn’t have to run the entire time you use the staple gun. 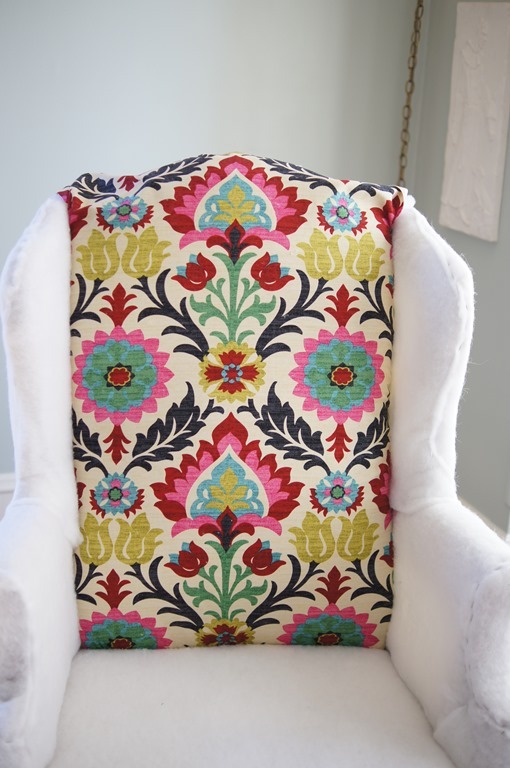 this is one of my favorite DIYs yet & now I want to reupholster everything we have in this gorgeous fabric! 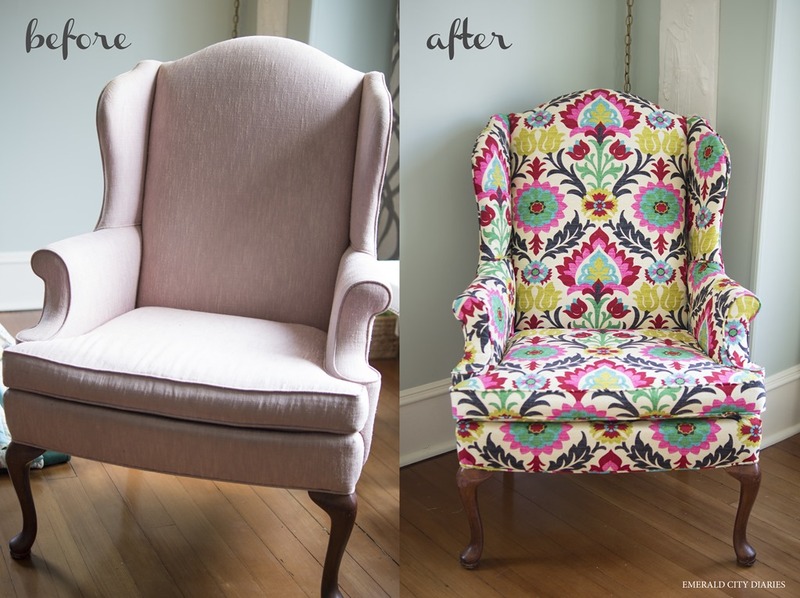 have you reupholstered anything recently? I’d love to see! 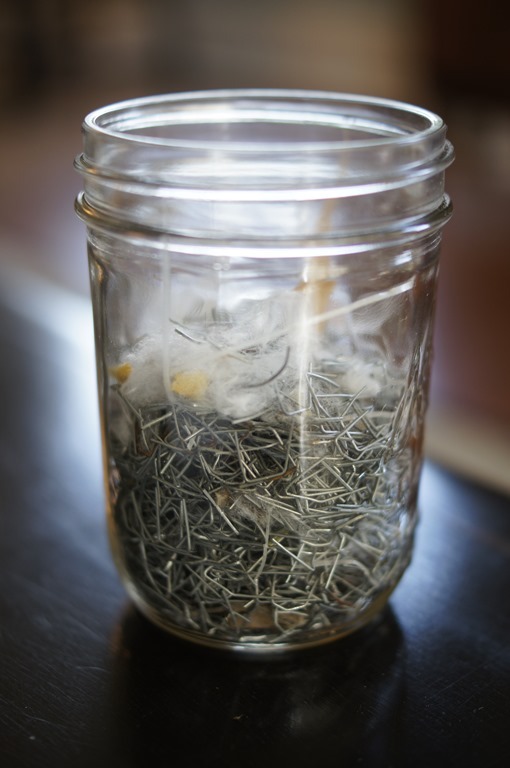 This entry was posted in craft, diy, furniture, house, house decor, pinspiration, pinterest, SLR camera. Bookmark the permalink. Misha – oh, my! Such a professional looking product.. Kudos to YOU! 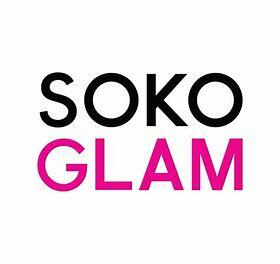 I think there’s a second career waiting for you! I want to say amazing, but really that doesn’t do it justice. Awesome job on a very complicated project. Love it! WOW! You are so talented! Love the chair and looks sooo professional! Amanda’s Aunt Sherry thinks you are very talented. 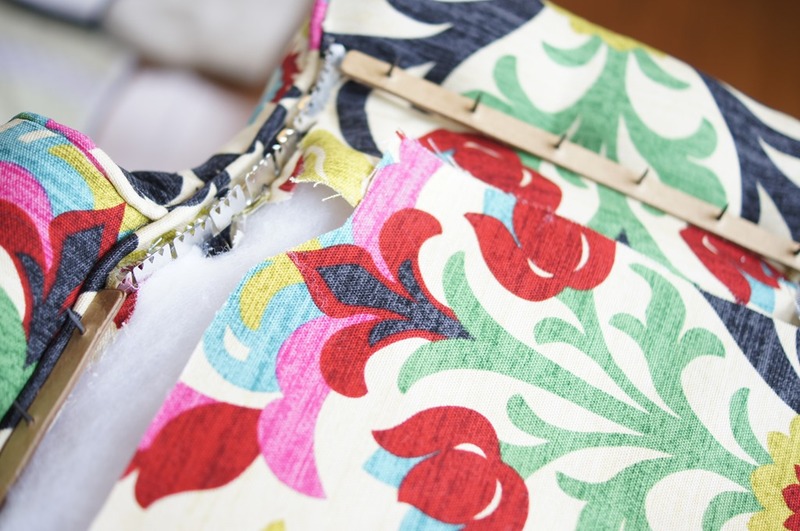 I love the design of your fabric and so enjoyed seeing the final result. 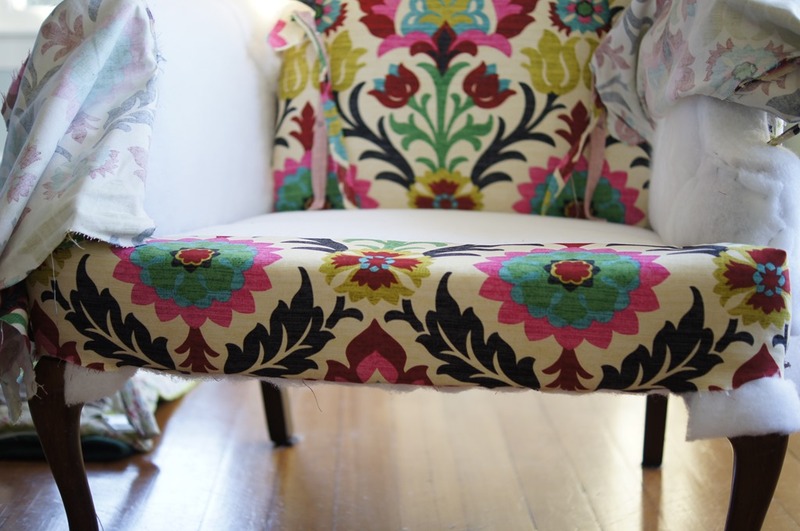 I have an ottoman and chair with same fabric! Love your taste. What paint color do you have on walls in the last pic? Thank you Mireya! This fabric is amazing, isn’t it? The wall color is Valspar Carolina Club Inn Aqua. It is a great color! What kind of camera do you use? By the way, this is gorgeous work! I am just getting into reupholstery and I love it! I’ve been trying to find easier projects to start out with because I’m new to this whole process and I came across this. It looks like you’ve put a lot of work into it, but it looks totally worth it! I’m a fan! Hello Jordyn! I use a Sony A55, though admittedly some of my pictures are from my iPhone. Good for you for reupholstering! It’s a lot of work but so fun and worth it. This chair was my first big project and I love the way it turned out, but with a little one it will be some time before I take on anything similar. 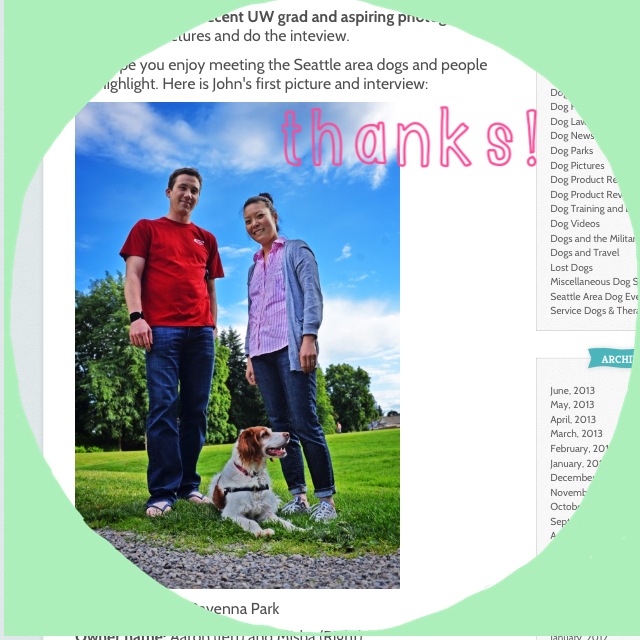 Best of luck and thanks for reading! How much ply grip did you end up buying? Thanks for the detailed info and photos; your post gave me the confidence to dive in and try my first reupholstery project, and it came out great!! The staple removal took literally DAYS. Lauren, this looks amazing! Such a great job. I am so happy I could help encourage. 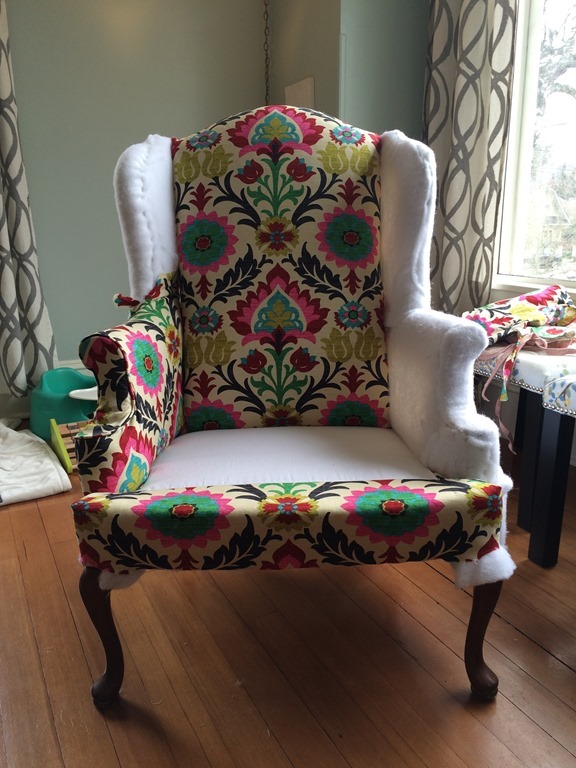 It is pretty incredible to be able to reupholster a chair, right? But the staple removal… so many staples. Thank you SO much for sharing! Hi Misha, thanks for checking it out!! ^_^ I thought I might decide I NEVER wanted to reupholster anything again, but it wasn’t like that at all. 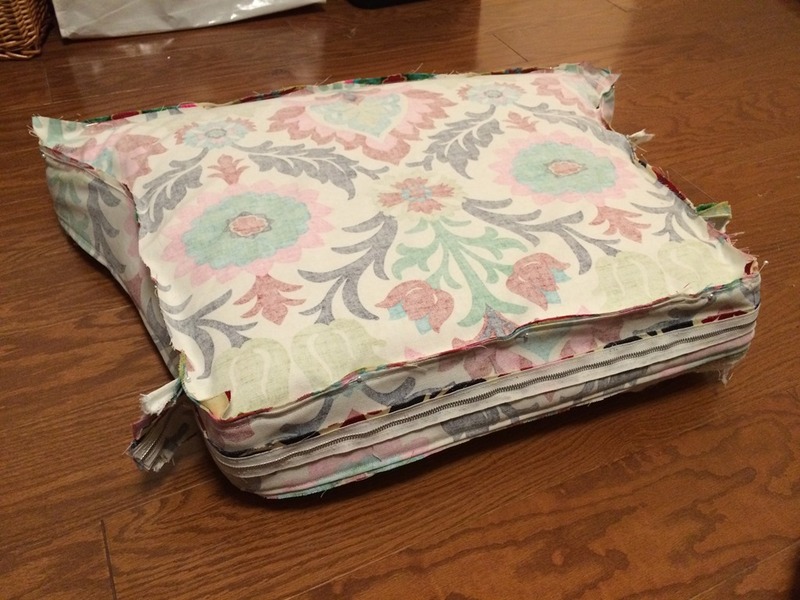 Very satisfying to put it all back together…I’m definitely casting my eye towards the next project. Yes this is great! It’s definitely not for the faint of heart, but there is something really satisfying about getting all the pieces back together!